Chocolate-almond zucchini muffins dusted with powdered sweetener and cocoa. As long as zucchini keeps fruiting, I’ll keep making zucchini muffins. This week I decided to make a not-gluten-free version of chocolate zucchini muffins. It has whole wheat, plus a little almond flour for richness. If you love almonds, you can increase the almond flour to ½ cup if you like, in which case you should reduce the whole wheat flour or cocoa powder by ¼ cup. If you don’t love almonds, use 1½ cups wheat flour and no almond flour. If we get more zucchini next week, I’m thinking I’ll make a citrusy muffin. I’ve made zucchini-orange marmalade and it’s heavenly. Maybe I should make both to go together! Haven’t decided yet whether to do wheat or make it gluten-free. Thoughts? *You can make your own powdered xylitol or powdered erythritol by running the granulated version in a blender or coffee grinder until it’s the right consistency. In a blender, puree about half of the zucchini, the flax seed, the vanilla, the oil and coffee or chicory until smooth. In a bowl, mix the flours, cocoa powder, salt, baking soda, baking powder, spice, and xylitol or sugar. Add the remainder of the grated zucchini (that you didn’t put in the bender) to the flour mixture and mix until well blended. Bake 20-25 minutes in a 375°F oven. Muffins are ready when inserted toothpick comes out mostly clean. Sprinkle with powdered sugar/xylitol and/or powdered hot cocoa mix if desired. Serve immediately if you want the powdered stuff to be visible. After 30 minutes or so it absorbs into the muffin and is not longer visible. 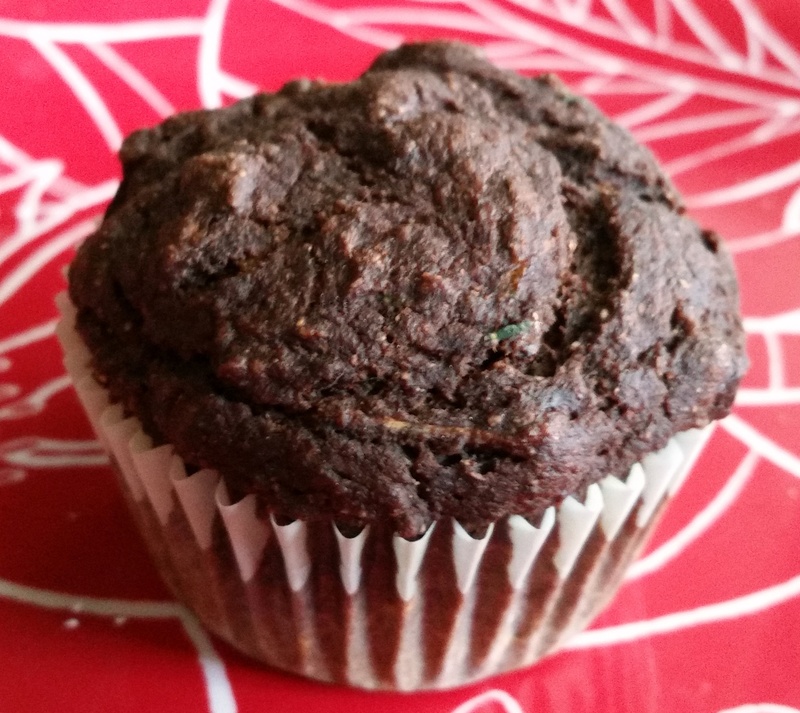 Chocolate-almond zucchini muffin without powdered topping.